Keep your Shar-Pei's attention on you during training sessions. The Shar-Pei is a strong-willed breed of dog that needs a firm, yet gentle hand during training. Without strong leadership and consistent training, your Shar-Pei may simply take charge and lead you around by the nose. Use positive reinforcement and plenty of treats to keep your Shar-Pei in line. Socialize your Shar-Pei pup at a young age, starting around 10 weeks, to other dogs and a variety of people. Your Shar-Pei must be taught to tolerate other people and pups because the breed can be very wary of strangers and somewhat dog-aggressive otherwise. Puppy kindergarten is a great way to expose your wrinkly pooch to lots of friendly strangers and pups for him to interact with, recommends Dr. Jeff Vidt. Bring your Shar-Pei out to the same potty area every two hours until he gets the hang of eliminating outdoors. Reward him with a treat and praise when he does his business to positively reinforce the behavior. While crating your pooch between bathroom breaks helps with potty training to prevent accidents, it may not even be necessary with your pup. Shar-Peis are a very fastidious breed and are reluctant to eliminate in the home, making potty training much easier than with other breeds. Train your pooch to associate a clicking sound, from a clicker training device, with a food reward. Click the device, then immediately reward your pup until he associates the clicking sound as something good. Shar-Peis don't respond well to punishment-based training, which can encourage aggression in this breed. Clicker-training uses positive rewards and praise to elicit the desired behaviors from your pooch. Teach your Shar-Pei basic verbal commands like "Sit," "Stay" and "Leave-it" using the clicker. Say the command, using an authoritative tone and either lure or catch the desired behavior you want. Once your pup performs the behavior, immediately click and treat him. Keep training sessions short, to no more than 15 minutes at a time, because Shar-Peis become easily bored and may begin to ignore your training if it isn't fun for them. Enroll your Shar-Pei in local obedience classes offered through your local breed club, such as the Chinese Shar-Pei Club of America, or SPCA. 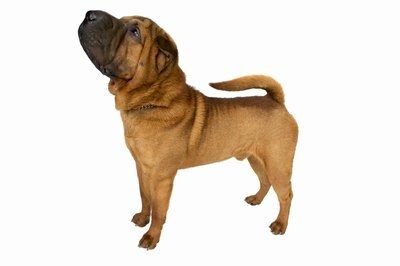 An obedience trainer can help to focus your stubborn Shar-Pei during obedience lessons, giving you pointers on dealing with such an independent breed. Choose an instructor that only uses positive training methods, not negative ones. Use a firm, authoritative voice when training and issuing commands to your pup so you can maintain control over your stubborn Shar-Pei. When he performs a desired behavior, lavish him with overtly exaggerated praise; use a happy tone to differentiate the two types of voices for your dog. Reward your pup around other friendly dogs and people to positively reinforce these experiences, especially if you plan on showing your pup professionally. Shar-Peis make excellent guard dogs, but need to learn the difference between good strangers and potentially scary ones. Never train your Shar-Pei outdoors if the weather is very hot and humid. The Shar-Pei is a brachycephalic breed, prone to overheating in warm weather. Instead, stick to training in a temperature-controlled environment. Neuter your Shar-Pei; male pups of this breed can be extremely dog-aggressive if not fixed, recommends PetWave. How Often Should You Wash Your Shar Pei?